Mercedes absolutely crushed their opposition for three consecutive seasons, with Lewis Hamilton and Nico Rosberg successfully defending both the constructors and driver's championships year-after-year. 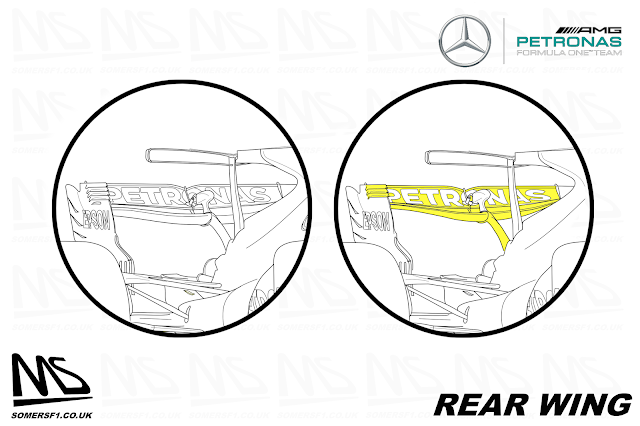 But, a ray of hope shone on the horizon, a change that might just reset the competitive order and required Mercedes to do what no other had done before - win back-to-back titles whilst straddling a regulation change. 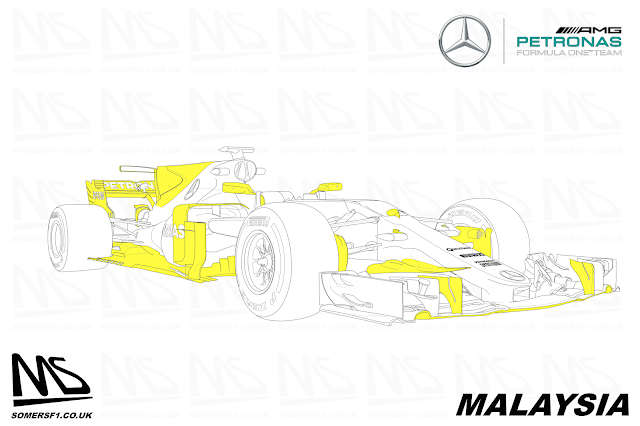 And boy was it a change, as for the first time in the sports history the FIA were relenting and handing back some of the technical freedoms that had been lost in previous years. 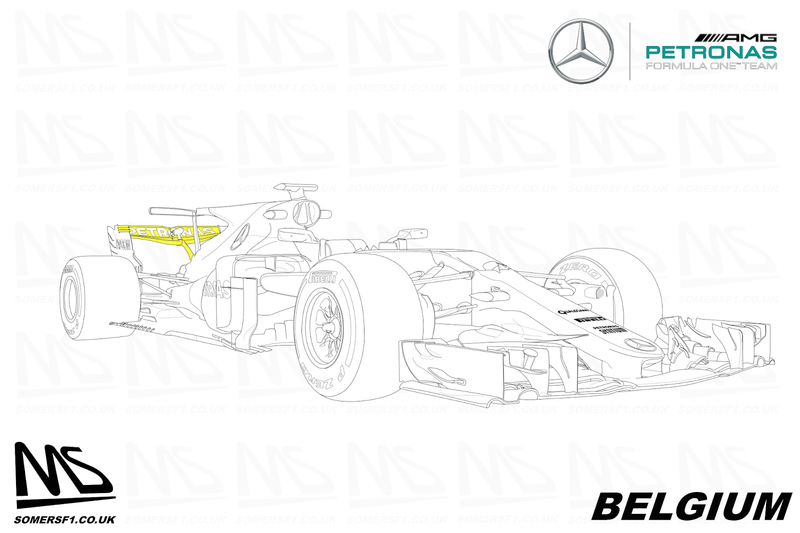 For 2017 we were promised wider, meaner and devastatingly faster cars, all of which would be made possible by a huge regulation overhaul that would give the teams access to a huge amount of downforce. A slice of the five second per lap improvement that the FIA were targeting was to come from a new range of Pirelli tyres and saw the width of the car increase for the first time since 1998, helping to give the more aggressive aesthetic that the governing body yearned after. Mercedes, Ferrari and Red Bull had the resources to assist the Italian tyre manufacturer to prepare for the challenge that lay ahead and all built 'mule' cars to try a give a depiction of life with 2017 levels of downforce. It was a spectacular failure, as the designers tasked with converting the cars were hamstrung by a collection of technical directives designed to target areas of the cars that could and couldn't be developed, leading to cars that couldn't replicate the levels of downforce expected in 2017. Irrespective of this the tests continued throughout 2016, with Ferrari sending one of their two main drivers to almost every test, whereas Mercedes and Red Bull preferred not to. 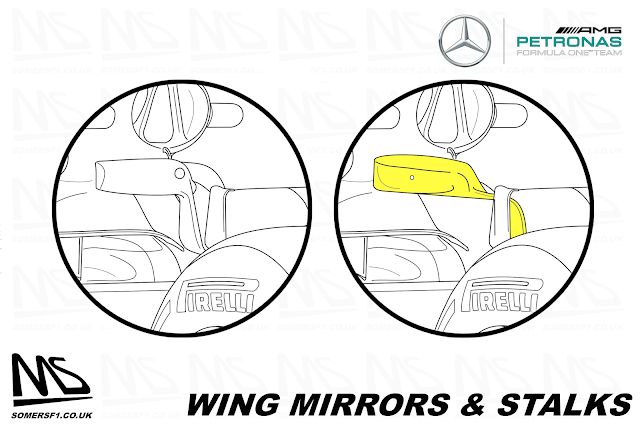 It could be argued that this swayed development, but where it most likely had the most impact is how the drivers feedback was used with the data gathered to maximise Ferrari's approach to the design of their car. 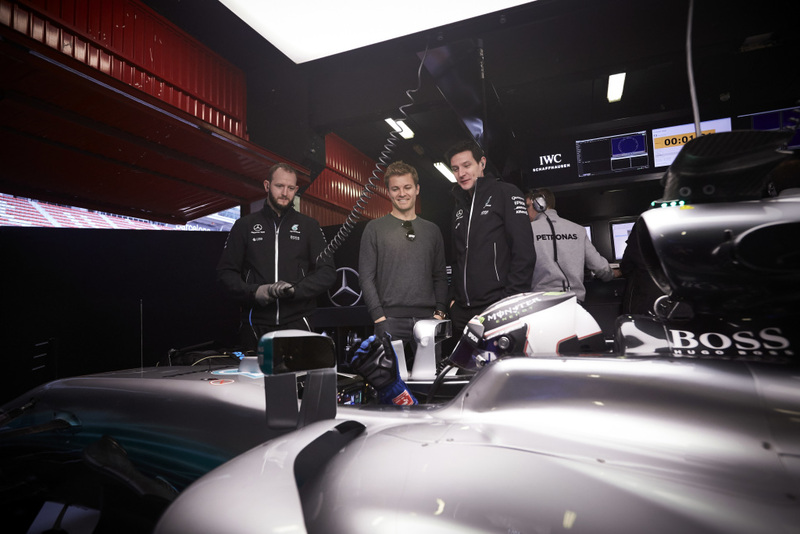 Just a few days after completing his lifelong ambition, Nico Rosberg decided to hang up his racing boots, a decision that undoubtedly threw Mercedes into disarray. 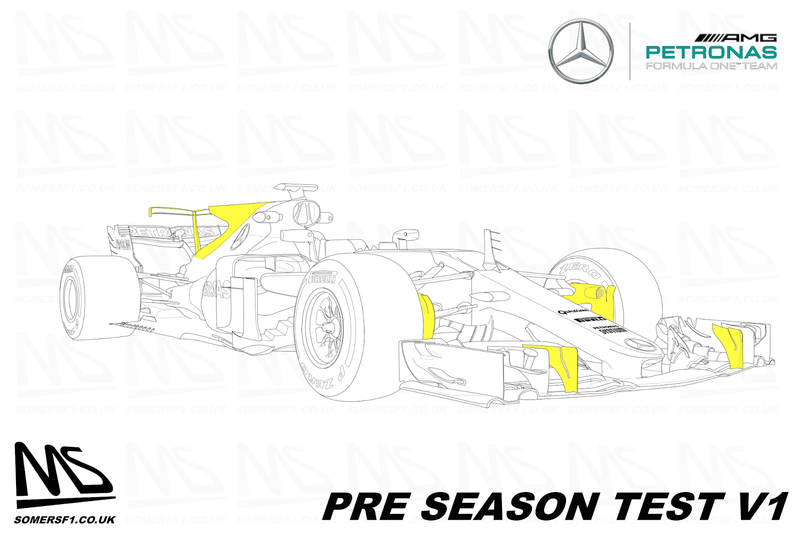 After a long and jarring season that has seen your drivers go at it week-after-week and with an impending regulation change as large as the one faced for 2017 it was clearly going to destabilise the team. Valterri Bottas swiftly came out as favourite to replace the German, although the team were courted by numerous drivers outside their programme, whilst consideration was also given to their two juniors - Pascal Wehrlein and Esteban Ocon. 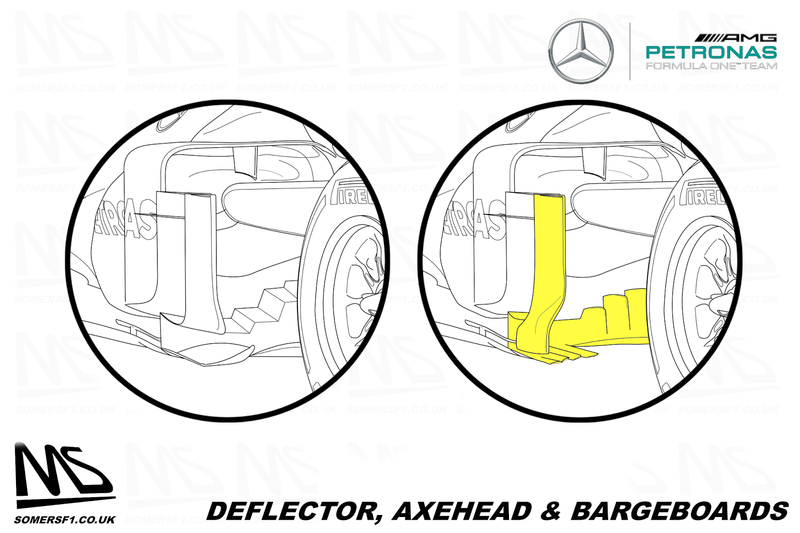 Mercedes, now back-peddling were about to be delivered another hammer blow, as a request for clarification by Ferrari led to a technical directive being issued. Charlie Whiting was forced to clarify his position on the use of ancillary suspension components and systems that could store energy and use at a later point, suggesting any such systems contravene the regulations. This was a pretty significant blow, especially in such close proximity to winter testing, as the cars design was defined and for the long lead items, already constructed. These systems, known as HPC (Hydraulic Pitch Control) are the continuation of the R&D work done whilst FRIC (Front-to-Rear-InterConnected) was considered legal, with the teams looking to retain the same kind of control, just without the connectivity. Mercedes, who were at the forefront of FRIC's development were considered to have the most mature HPC system, although almost everyone would be hurt by the ban as they were all using using or looking into the system in one form or another. Ferrari's innovative 2017 challenger which featured a very interesting sidepod layout, helping the designers to overcome some of the negative elements of the new regulations. A destabilised run-in to the start of the season aside, it quickly became apparent that Ferrari had made huge strides, as the SF70H proved to be an exceptionally well rounded and balanced car, easy to setup and quick, pretty much straight out of the box. This was in sharp contrast to both Mercedes, who had to work tirelessly to resolve their issues and Red Bull, who suffered with correlation issues and an over simplification of their aero philosophy. When pressed about the teams issues with their 2017 challenger Toto Wolff's go-to response was that the W08 was a bit of a diva, citing issues with the operating window of their challenger. Making setup changes in one direction would rectify one inefficiency, but usually lead to another issue that had to be overcome. When they did find that sweet spot though, it was a devastatingly quick machine, unrivalled by their adversaries in a season that never really saw a proper wheel-to-wheel battle between the two closest title protagonists - Lewis Hamilton and Sebastian Vettel, which is probably the biggest disappointment in a year that was full of drama and intrigue. 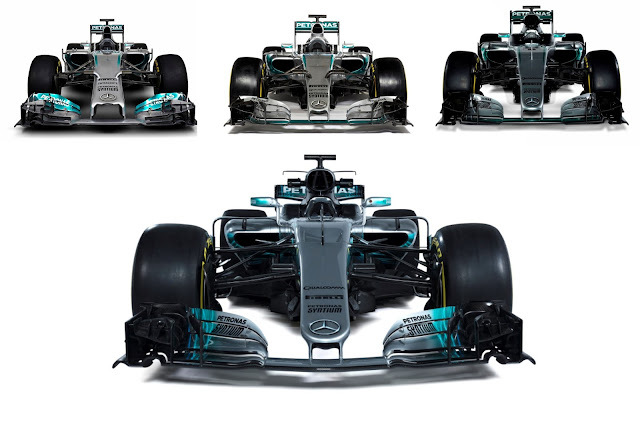 As the W08 was unveiled it became immediately apparent that the 2017 challenger was a direct descendant of its predecessor's, an evolution of their low rake philosophy that had captured them the last 3 championships, rather than a complete revolution as others had undertaken. The launch car was complex, much like the W07 that had gone before it, but it was obvious that the team had much more to come, taking advantage of some of the freedoms that the new regulations afforded. However, where they showed their hand immediately was the installation of a T-Wing, as they sported a single element variant of the the much-derided appendage. As winter testing got underway so did Mercedes test programme, which as ever was an extensive one, featuring back-to-back running with new and old bodywork as the team confirmed the W08 was performing as expected. 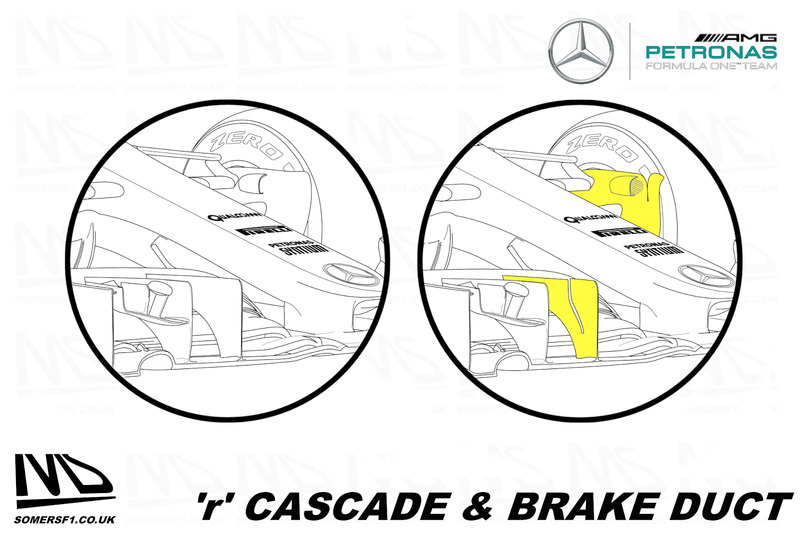 They started with smaller optimisations, such as the slot introduced in the front wings 'r' cascade and the revised shape of the brake duct fence, which changed the flow around the front tyre and also required the movement of inlet scoop. The inlet scoop was also furnished with a succession of bars across its entrance, reducing the chance of debris being collected by the inlet, which could lead to the brakes overheating. 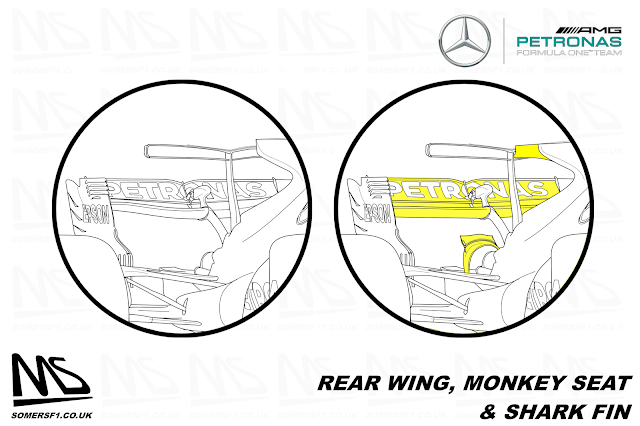 At the rear of the car, the T-Wing, mounted on its own pillar (Mercedes were the only team to do this) which intersected the exhaust (a trick first used by Toro Rosso) was revised and now featured two horizontal elements, framed by overhanging endplates. 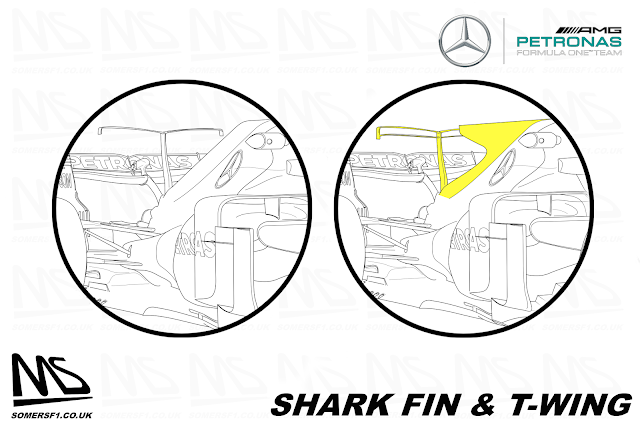 Meanwhile, their first iteration shark fin made its appearance and would be used to help balance the car in yaw. The second wave of test items for the winter test focused on the area of low-hanging fruit - the area ahead of the sidepods, with new slotted bargeboards (similar to the W-Floor used in 2016) utilised, whilst the forward element of the new for 2017 vertical deflector was revised, mounted atop a now serrated floor axehead. Meanwhile, the T-Wing was optimised further, as the team lost the vertical over extending endplates in favour of a looped design, whilst a novel solution to the teams cooling requirements was also tested - as the shark fin engine cover featured a cooling chimney, allowing heat generated within the cover a route with which to escape. Unless the team are willing to accept substantial costs the specification used in the opening few races is often baked in, given the car and associated parts are all packed and shipped out by air weeks in advance, giving rise to the term 'fly-aways'. In 2017, with the opening three races taking place within four weeks, on the other side of the world, the teams had to be prepared to accept that largescale changes were either going to cost a considerable amount of money to use external shipping methods or were simply locked into components loaded onto the freight destined for each venue. This can lead to compromised qualifying and race pace if something hasn't been fully accounted for, with temperatures a critical consideration for powerunit performance, driver comfort and even braking efficiency. Logistics aside progress continues unabated in Formula One, with even small margins sought in order to improve, even if only by a thousandth of a second. 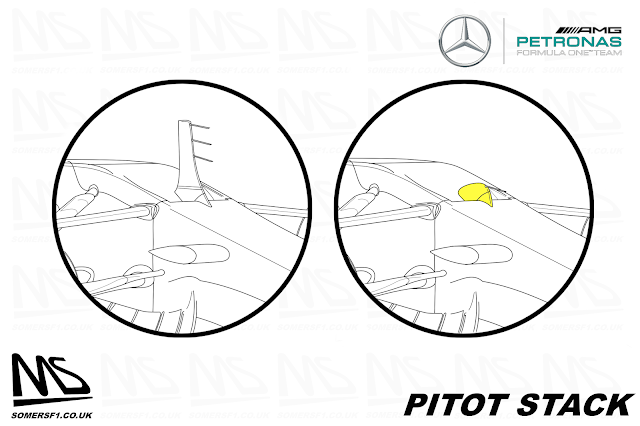 For Bahrain this came in two forms, firstly, the large triple pitot stack was replaced for qualifying and the race for a much shorter solution, given the team had used the more complicated variant for its data gathering exercise during the Free Practice sessions and clearly felt the stack impeded airflow, even if only by a negligible amount. 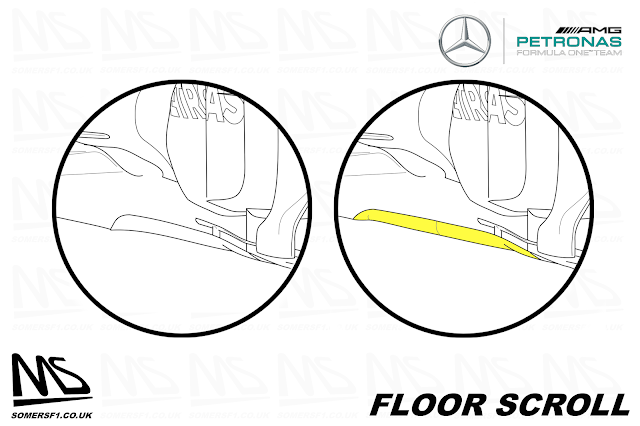 Secondly, the team revised the floor ahead of the rear tyre, introducing a small triangular upstand in order to change the behaviour of the airflow before it meets with the face of the tyre. This would not require an entire floor to be flown in, rather the team could just ship in a small panel or 3D print it on site and stitch it into the floor, a practice that has become commonplace up and down the grid, especially in aero sensitive areas such as this that are modified quite often, aren't necessarily subjected to significant forces and are less geometrically complex. The Spanish GP is always seen as somewhat of a development waypoint by the teams, given their ability to arrive at the circuit with their own trucks and motorhomes, shortening their production lead times significantly. As such, we tend to see fairly substantial upgrade packages, focused on rectifying any inefficiencies first found with the design and really honing in on the cars performance potential. It's also a high downforce circuit, that the teams know like the back of their hands, given the time spent there during winter testing, meaning that not only do they have the data being collected on the Grand Prix weekend to fall back on but also quantative data from the tests. 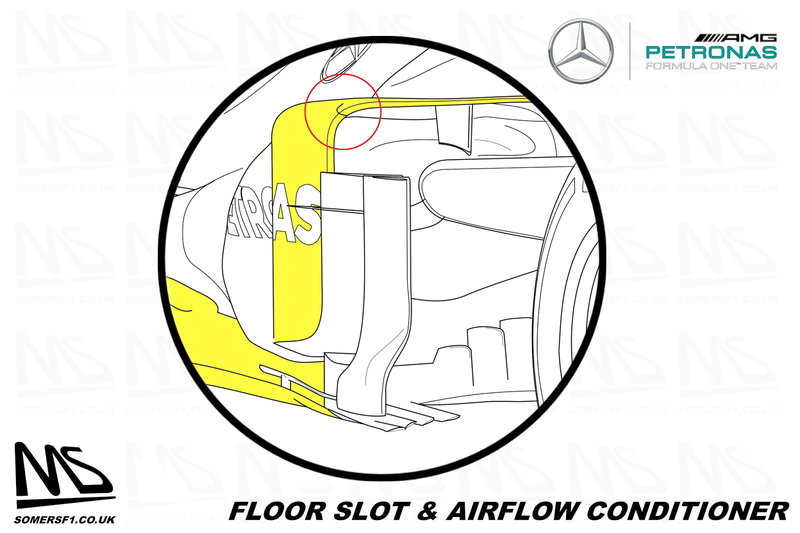 The upgrade package introduced by Mercedes in Spain was a significant one, as we can see by the number of components highlighted in yellow on the main diagram. However, the singlemost important and frankly awe-inspiring of those was the redesign of the nose and introduction of what the team termed the 'SuperTed Cape' draped around the flanks of it. I've highlighted the 'Cape' in the right hand inset to show the sheer size of this never been seen before component, which not only changes the nose from a three dimensional flow perspective but also impacts the 'S' duct, seeing as the inlet position is moved and absorbs the role of the turning vanes, which are ordinarily mounted a little further back. Clearly this design is something that had been worked on extensively in Brackley, not only because it required a serious amount of CFD and wind tunnel time to perfect but also because it required some lateral thinking and the nose to pass a new crash test. The reason for the new crash test is that the entire nosecone was a fresh design, much thinner than its predecessor (see highlighted lines in right-hand inset, you may have to click to zoon) allowing the 'cape' to occupy some of the space necessary for it to flourish from an aerodynamic perspective. 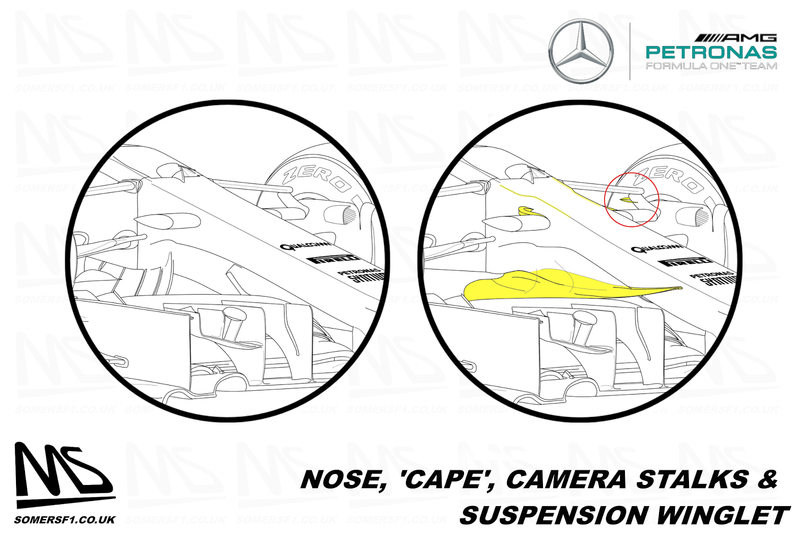 The nose mounted camera's were also given new mounting stalks in order to position them correctly, away from the surface of the nose and in a more optimum position, aerodynamically. I've also circled a small winglet that was added to the front suspensions upright extension, revising the flow around the extension and adjusting the wake generated by the front tyre. The team also made revisions to their floor in Spain, revising a longitundinal slot that had been placed parallel to the floors edge, taking advantage of some of the wording in the regulations that hadn't been amended to suit the width of the new cars. 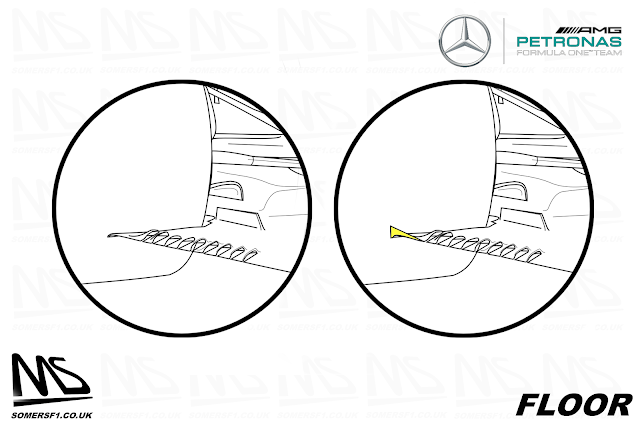 This also led to a change in the airflow conditioner that flanks the sidepod, with a curved slot cut into the leading edge (red circle) in order that if the car were viewed from beneath it would provide a mirror, another consequence of the wording of the regulations. 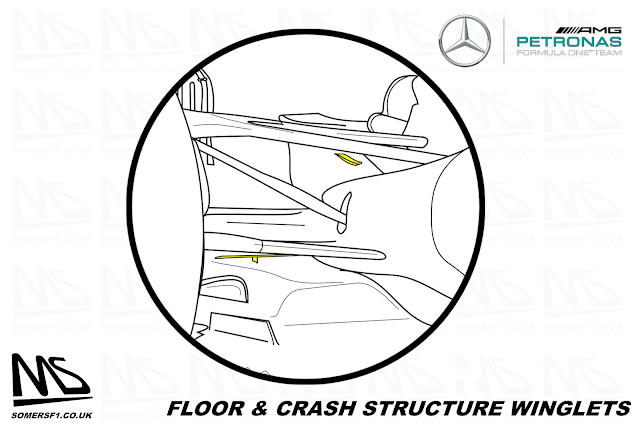 The triangular floor upstand introduced in Bahrain was also optimised further, as the team removed said appendage and ran with a flap above the floor instead. At the rear of the car the team needed to improve rear stability and downforce for the Circuit de Catalunya and so ran with a steeper angle of attack and more conventional rear wing shape, having run a 'Spoon' shaped rear wing up until that point. This was supplemented by a double element Y100 winglet (or Monkey seat) which helps to overcome the stalling angle of the wing at lower speeds by upwashing the surrounding airflow and exhaust plume. Meanwhile, the shark fin engine cover, which had previously fell short of the T-Wing and its independant mounting pillar, was lengthened and mounted to the pillar. 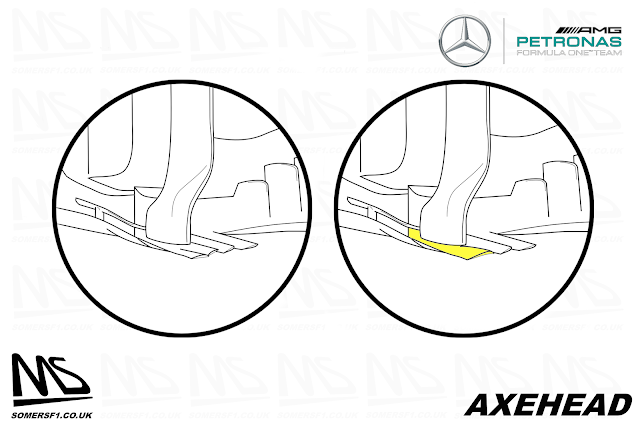 As the team returned back to the European circuit, having ventured off to Canada and Azerbaijan, the team had several new parts available in Austria, all of which optimised flow in their designated area. The slot and curved leading element on the front brake ducts fence was optimised to change flow around it. They introduced a new set of wing mirrors, which were wider than their predecessors, whilst the stalks they were mounted on were placed further inboard, changing their aerodynamic relationship with the vertical winglet ahead. The floor scroll on the edge of the floor was lengthened and the interior slot accompanied by a centralised slot running outwards up the scrolls surface to perforate the floor and legalise the interior slot. Improving flow at the rear of the car the team introduced a small winglet below the lower wishbone and added winglets either side of the crash structure, seemingly upwashing the surrounding flow in order to do the same to the plume exiting the wastegate exhausts. The 'spoon' style rear wing used by Mercedes in the early part of the season is used to try and maximise downforce whilst keenly observing the issues of drag. 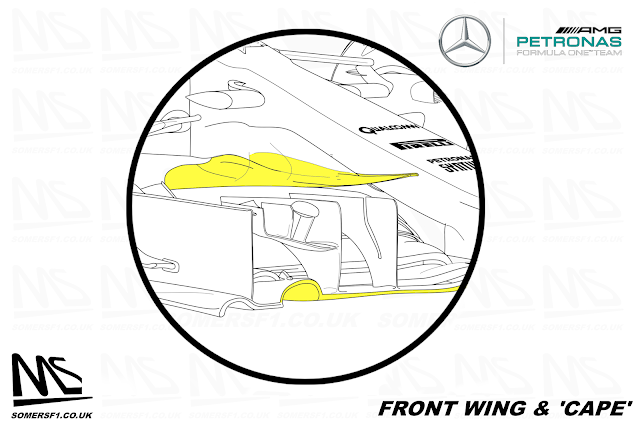 The spoon wing produces more downforce in the central section of the wing, whilst the shorter chord outer sections produce less downforce, hence less drag. 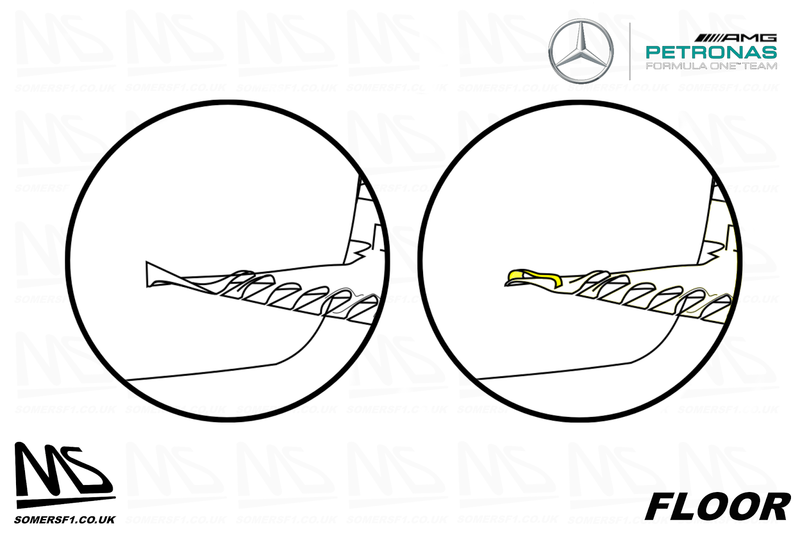 As we can see the wing used at Spa and Monza (right inset) was even shallower, reducing downforce and drag, so much so, that the louvres - of which Mercedes utilised the open-end style ones first introduced by Toro Rosso, were also down in quantity from 5 to 3, given the vortex formed at the wingtip and endplate juncture was lessened. Singapore, not a happy hunting ground for Mercedes historically, nor was it looking good in 2017 with the Mercedes drivers down in 5th and 6th on the grid, but then we had 'that' shunt into Turn 1 that not only changed the complexion of the race at hand but cemented the fate of the championship. Being a street circuit the team threw on as much downforce as possible, but they also had a new weapon in their arsenal too - a full length shark fin, buttressing the engine cover up against the T-Wing's mounting pillar. Malaysia threw up a rare odditiy for Mercedes, when Lewis Hamilton decided he just wasn't feeling the update parts the team had introduced and switched back to the older setup. However, Bottas pushed on and ran the new front wing, revised cape and floor. 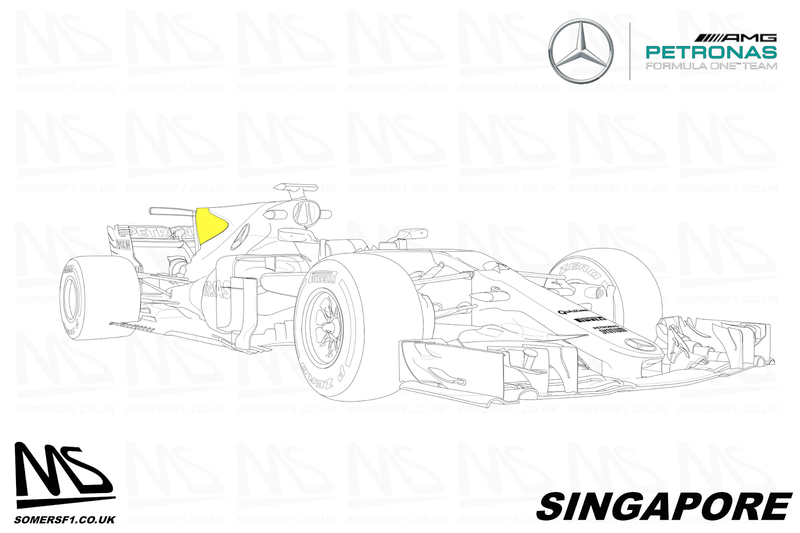 The designers had revised the leading edge of the front wing, upturning its edge in order to alter its pitch sensivity a smidge, whilst the 'cape' last revised in Austria when the team added a slot toward the rear of the structure now featured a much wider leading edge profile and another broader shape change toward its tail. In what might be considered a retrofit the team made a change to the serrated axehead too, conjoining the outer two sections, in order that only 3 surfaces existed instead of 4. Clearly I haven't shown you all of the updates run throughout the season here, but hopefully I've provided a decent overview of the main suite of updates run by the team. 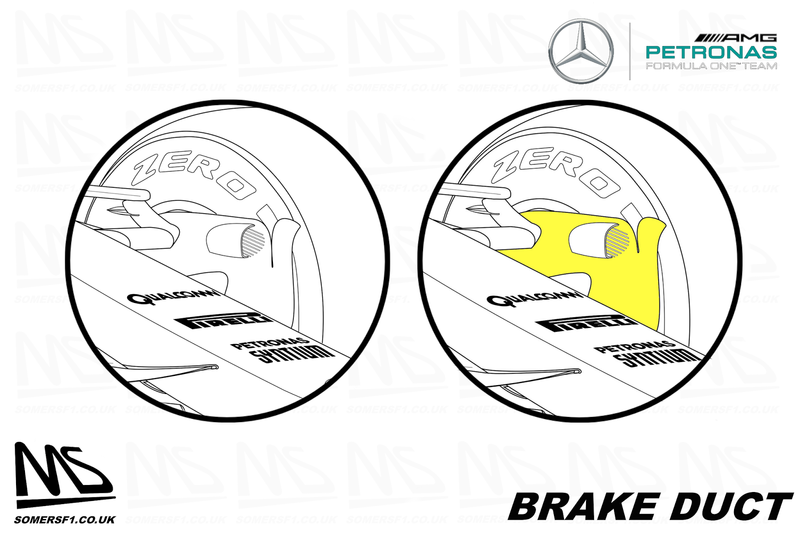 As a stark comparison the next two images show the difference between the launch car and the car that was run in Malaysia up until the last race, which goes to show that essentially (if we take into account cooling changes), every surface on the car has been optimised at one point or another. 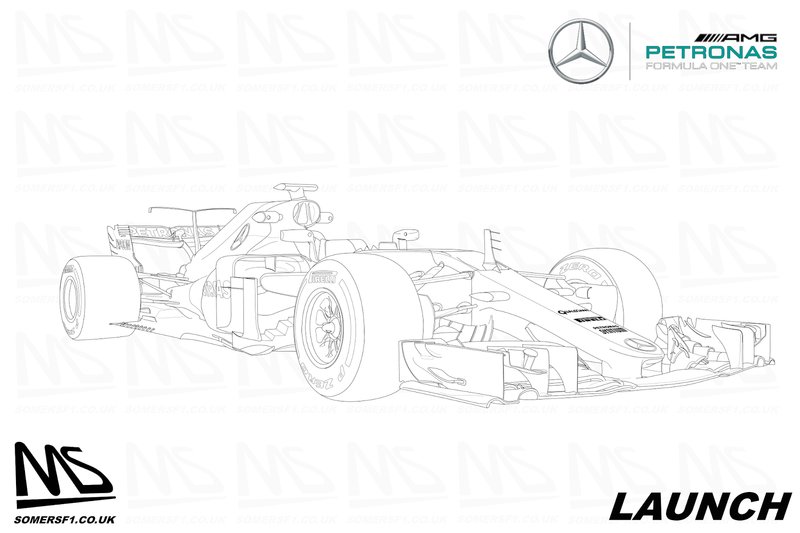 One of the key talking points of the W08 has been its long wheelbase, with many commentators fixated on the cars length, even going as far to suggest it was the cars achilles heel. In my mind Mercedes scaled the W08 to suit their already succesful design philosophy, knowing that the new regulations would allow them the design freedom to overcome any potential pitfalls that presented themselves. This proved more problematic when HPC was banned before the season even got underway, making the longer aerodynamic platform more difficult to tame. A switch now to a high rake philosophy, such as Red Bull, or to a slightly lesser extent Ferrari, would be extremely bold given the years of data and performance gained using their current ideology and the impeding threat posed by the aforementioned. 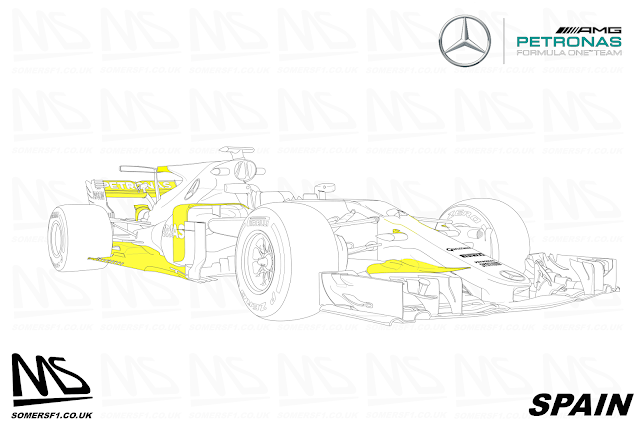 Add to this the scope for gains under the new regulations is still substantial and that the W08 was far from optimised, with chief designer - John Owen going as far to say that the car was designed to be '90%'. "We built a lot of adjustment into the car, the capability to react to things we saw." "I set the objective to build a 90% car for 2017, and whilst it might seem strange not to aim for 100%, the problem you face in any new set of rules is that you can't be certain of the challenges you'll face along the way - how the rules evolve, whether the tyres behave differently from how you expected." "Unfortunately, most of the things we had to adapt to we hadn't seen coming. So we carried a lot of compromise through the year for things that didn't need to be changed and we struggled a bit with those that did." This does not shout 'I'm running away from this concept' to me, in contrast I'd suggest that Mercedes are excited to have untapped potential still left available. 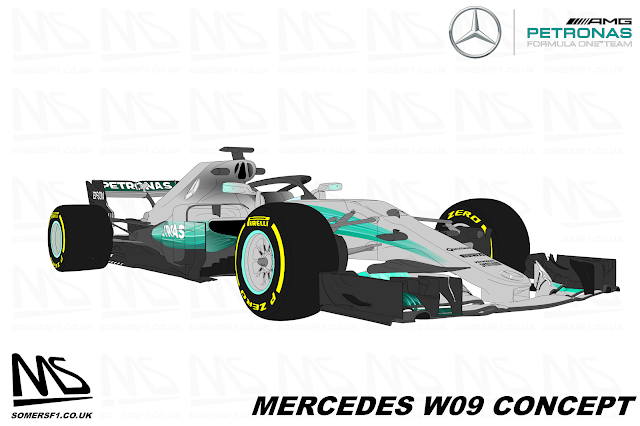 I suspect that the W09 will be slightly shorter and maybe have a tad more rake but this is dependant on not only the aero surfaces but the way in which the team want to set the car up mechanically and use the tyres, which will also be much more performance orientated in 2018. I've also put the illustrations together for a quick video which almost acts like an old fashioned flick book seeing as how I've used the original base image to draw on all the upgrades. Excellent compilation and analysis Somers! 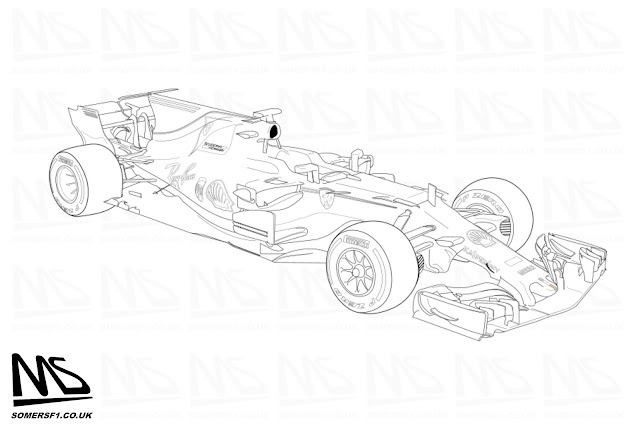 Are we likely to see a similar season-long view of the RB13 or any of the other cars on the 2017 grid?